Clear, whistled “whip-three-beers!,” with the middle note higher. Also “pilt, pilt” call. Description: Sexes similar. 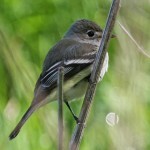 Brownish-olive above; sides and flanks brownish-olive and streaked, with streaking sometimes extending across breast; throat, center of breast, and belly dull white or pale yellow (appears to have dark vest on); white tufts on sides of rump (not often visible); proportionately short-tailed; and bill mostly black. 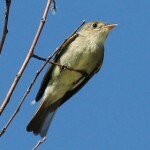 Juvenile is browner above, yellower below, and has browner sides. Food: Eats only winged insects; appears to avoid spiders, caterpillars, and other larvae. 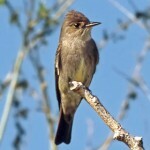 Habitat: Migrants often found in wooded areas with trees that have prominent dead upper branches. Sometimes seen perched on telephone wires in open country. 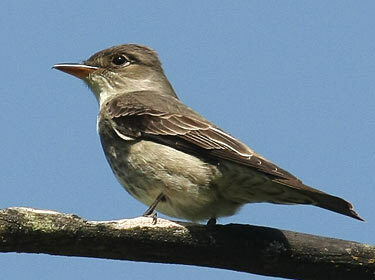 Where in Nebraska: Uncommon to occasional spring and fall migrant in the east, at least west to Lancaster County. Less common further west. No breeding records for Nebraska. Fun Facts: Song sounds like “quick, three beers”.